Today's hike was a comedy of errors. Every once in a while it is like that. More on this later. 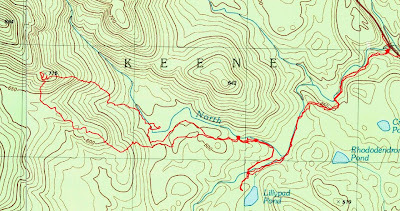 First of all, the trip plan was to start from Route 73 south of Keene Valley and hike the herd path to the East Dix slide. 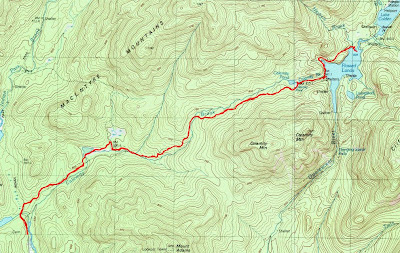 Then I would climb the slide and follow the ridge from East Dix down past Spotted Mountain and Elizabethtown #4, then drop back down to the South Branch Boquet River and retrace my steps out. I packed my things this morning and put all my drinks in my cooler to keep them cold as long as possible. After that, I was on the road. Ten minutes later, I got a call from my wife, Leesa, informing me that I left the cooler at home. Back I went. All my water bottles were in the cooler. Had to go back. Next I got to my parking location and started my hike. Again, 10 minutes later, I realized I didn't take the drinks from the cooler and put them in my pack! You can tell I was just excited to get hiking. The problem is that I'm not used to using a cooler, but now that it's hot, the cooler is in use. Now it was 9:30. Back on the trail I went. Usually I just stay on the south side of the North Boquet as I hike in. This time I would have preferred the more defined herd path that crosses to the north side of the Boquet about 10 minutes into the hike, but with the heavy rains of the past couple days, the water was high. It didn't look like a good option, especially since I had my dog Rev with me. Therefore, I stuck to my usual route. I was at Lilypad Pond in 30 minutes. I continued on and reached the final designated campsite in about 90 minutes. 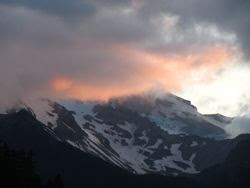 It is a large site located between the S. Branch Boquet River and a tributary that comes from near the Beckhorn Slide. I saw a backpack hanging high in a tree near the 1st waterfall on the Beckhorn tributary. Last designated campsite. 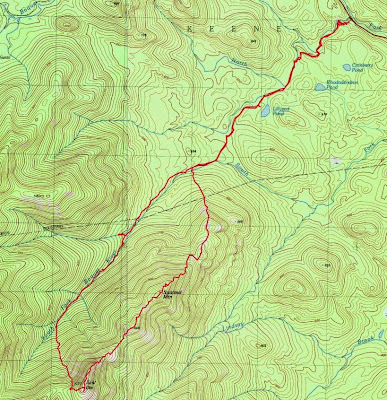 About 3.6 miles from Route 73. I continued on by following the herd path past the cairn located at the back of the campsite. Just upstream on the Boquet from the campsite is a nice swimming location. I passed that and kept going. I was surprised throughout the walk along the Boquet that the water had breached the banks in many locations in the past 2 days of heavy rain. I passed one more campsite just before the trail started climbing towards the slides, but I think it might be an illegal site and it is located adjacent to to the trail on the left. Immediately after that, I found a set of cookware in the trail. I left it there, not knowing why it was there. When the herd path came to the base of the East Dix slide, I noticed that the slide was almost entirely wet. I saw a cairn indicating it was time to step out onto the slide. I thought that perhaps it would be better to follow the herd path a little further and then step out onto the slide up higher where the rock would be dry. Take note... the herd path doesn't run parallel to the slide after that location. It veers towards the East Dix/South Dix col. By the time I realized it, I decided it wouldn't be worth while to try to cut back over. In minutes, I was on the ridge herd path. I turned left to head towards East Dix and was on the summit in 5 minutes. It had taken me about 3.5 hours to reach East Dix via my route. I stopped on the summit to have lunch. Afterwards I began working my way down the ridge. 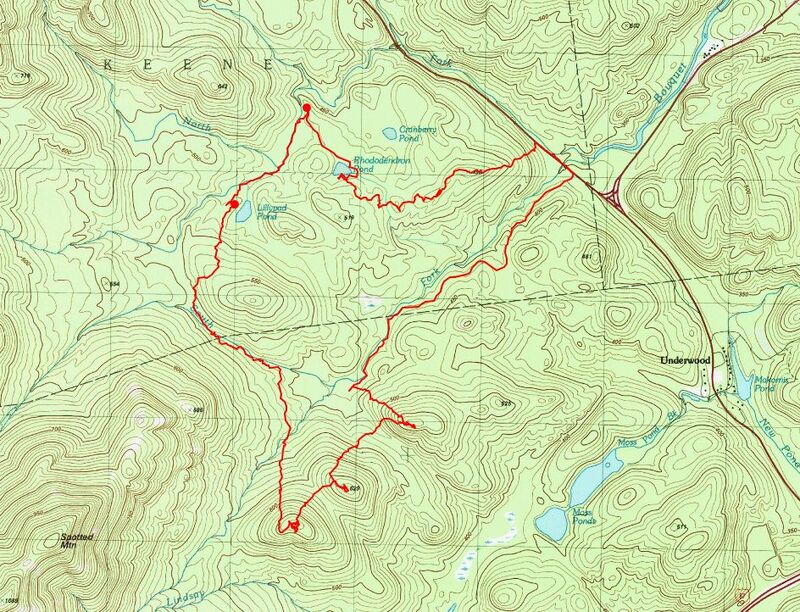 I had previously climbed Spotted Mountain, but I had never climbed the stretch between East Dix (Grace) and Spotted. Below are a bunch of pictures from the ridge as I headed down. I actually think the ridge gets better as you get lower. Spotted Mountain and Elizabethtown #4 are especially nice. The entire ridge offers lots of open rock, mixed in with some bushwhacking. It is thick in some spots. Faint herd paths can be found, but they are hard to stay on. Looking N towards Spotted Mountain. Giant and RPR in the background. 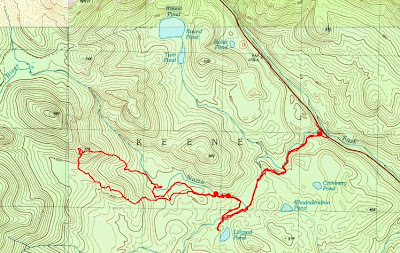 Once I got to Elizabethtown #4, I just headed slightly west of north to return to the herd path on the S. Branch Boquet River. After another hour I was back at the car. The entire trip took about 8 hours. 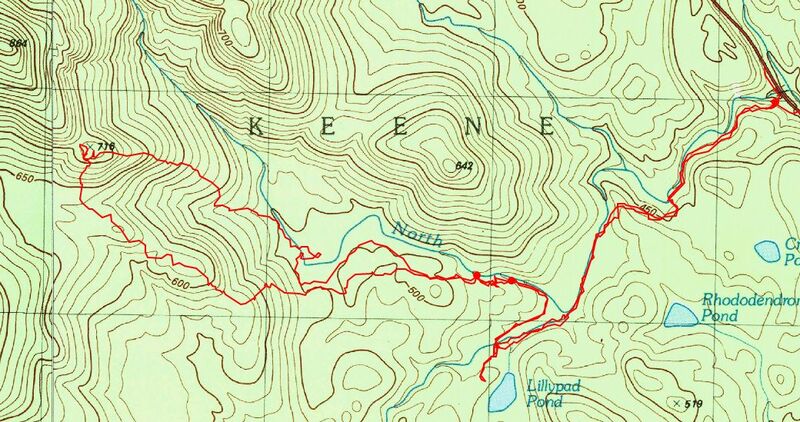 It really is a nice mix of following a stream (on a herd path), then the slide, then ridge walking (with open rock and bushwhack), then hardwoods back to the river and out. As I drove home, rain started in about 30 minutes. My timing was good. The Boquet River Valley in the Dix Mountain Wilderness of the Adirondack Park can provide almost limitless places for exploration. For my wife and I, It's a convenient place to get to and it's a whole lot of fun. 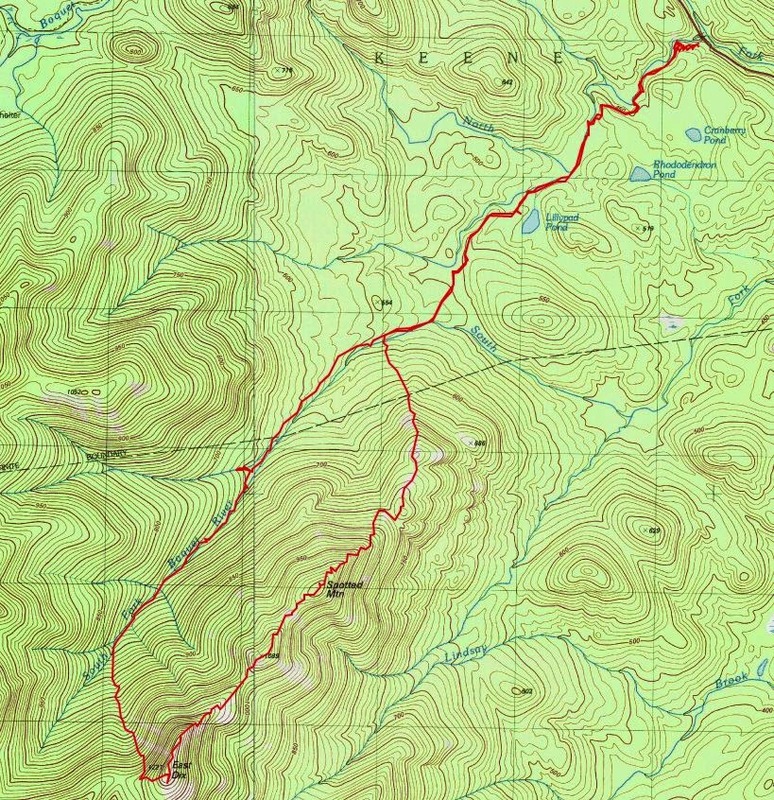 On this trip, Leesa and I wanted to head for an unmamed hill, labeled on our map with an elevation of 864 meters. To head there, we parked on Route 73 and followed a herd path on the south side of the North Branch Boquet River. 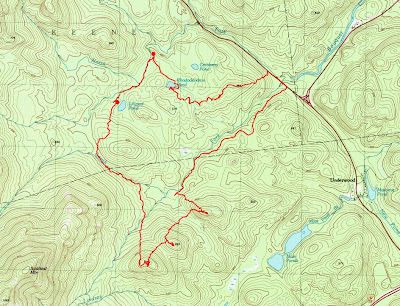 Once we got to LilyPad Pond, we crossed a tributary and hooked back to the N. Branch (it had turned NW a little earlier). 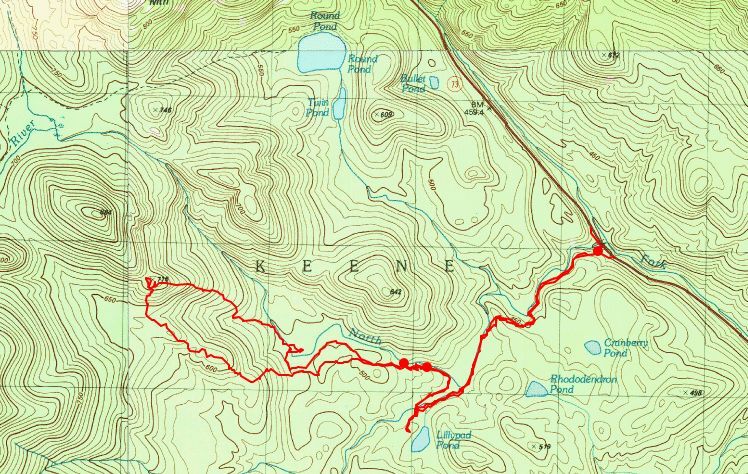 The herd path grew faint on the west side of the North Branch as we made our way NW. Right at that point, we found a little knoll with a fire ring. There was also a couple great swimming holes at that point. Most of the water pictures below were taken at that point. Shortly afterwards we came to a wetland area and it was time to veer more to the NW and start climbing the hill. After a hour or so on the bushwhack portion of the hike we came to the first false summit at elevation 774 meters. It was an area of open rock that afforded nice views of Elizabethtown #4, Spotted Mountain and Grace. A good view of the Beckhorn slide. Fun water holes for swimming. Back at the swimming hole we took off our boots and soaked our feet. The water was still a bit cold for swimming. We also had a few snacks and explored around the area. 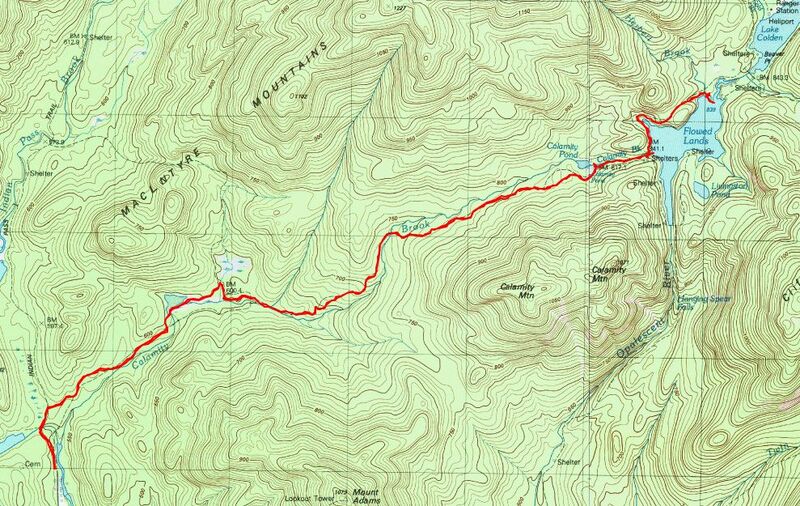 The location of the swimming holes is identified with a dot on the route map at the end of this post. Once back across the tributary and over to Lilypad Pond, we went back along the south side of the N. Branch Boquet River. There isn't much of a herd path there until you get to the designated campsite﻿ on the knoll. From there, you can follow the herd path back, or the other one to Rhododendren Pond. We just went back at that point. Can't wait to swim in the swimming holes though!